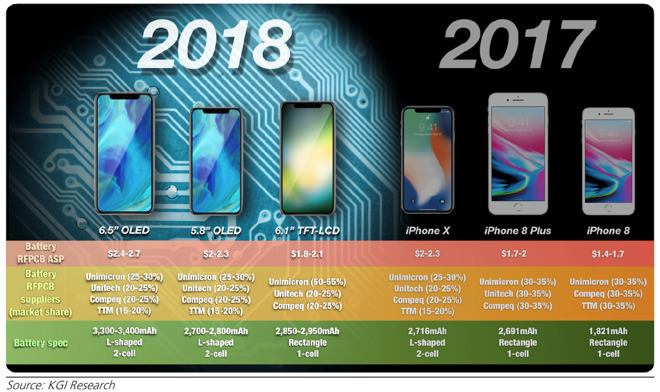 Analyst Ming-Chi Kuo has slightly refined predictions for the 2018 iPhone lineup, with the analyst seeing the LCD 6.1-inch model beating out the 5.8-inch and 6.5-inch OLED models in sales volume for the next three quarters. As previously predicted, Kuo in a note to investors seen by AppleInsider reiterated his belief that the two new OLED iPhone models will be available in September. 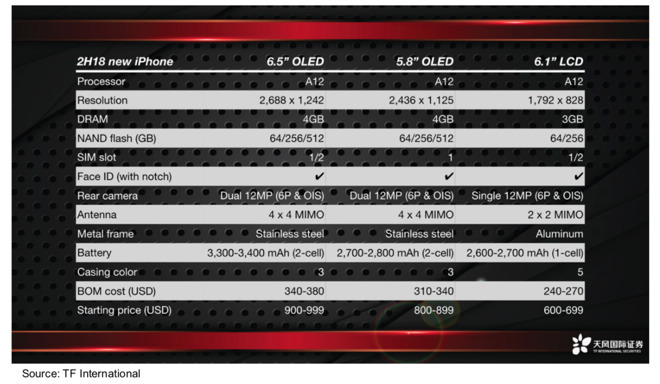 However, the widely anticipated 6.1-inch lower-cost LCD iPhone model will be made available to consumers a bit later. Kuo continues to maintain that the new 6.1-inch LCD and 6.5-inch OLED iPhone models will have single-SIM and dual-SIM versions. At present, it does not appear that the dual-SIM models will be available in the United States. The less expensive LCD model is not expected to have the A11 processor as found in the iPhone 8 and iPhone X. Kuo believes that the it will equipped with the "A12," the same as the OLED models. This model is expected to seize between 50 percent and 55 percent of the total unit sales by the end of calendar year 2018, and up to 70 percent in the beginning of 2019. Contrary to other reports, Kuo predicts that the new iPhone models will not support the Apple Pencil, as "it does not currently offer a good user experience," according to the report. Multiple reports have indicated that the 5.8- and 6.5-inch phones will have OLED displays, while the 6.1-inch model will use an LCD. The 6.1-inch LCD phone is expected to cost around $600-700, while the 5.8-inch model slots in at between $800 and 900, with the 6.5-inch model coming in at least $999. The reveal event for the 2018 iPhone lineup is expected to be on September 12.